Sift the Corn Flour and all purpose flour together. Cream Butter for 2-3 minutes with a beater till it becomes a pale yellow. Gradually add icing sugar also known as confectioner’s sugar. Continue beating till the sugar and butter are almost white in colour. Add Vanilla extract and sifted flour and continue beating at a low speed till the flours are well incorporated. It will take a minute or two. Add Milk if the dough is dry and crumbly. If you are piping the cookies then it is preferred to add milk. This makes it easier to pipe. To pipe the cookies, line a baking tray with butter / parchment paper, fit a nozzle in the piping bag and fill half the bag with the dough and pipe the cookies in the desired shapes. 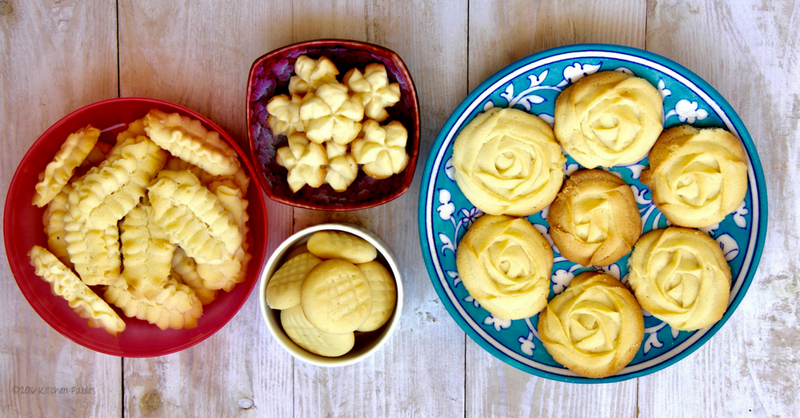 I prefer the Start Nozzle as my Daughter loves to call the butter cookies as Rose cookies. You can also take a small portion of dough in your hand and roll it into a ball. Make a Criss Cross with a fork. Chill the cookies in the refrigerator for a minimum of 30 minutes. After 30 minutes, bake the cookies in the pre-heated oven at 190 degrees for 10 to 12 minutes or till the edges start turning golden brown. Once baked, take the cookies out and place them on the wire wrack. After 15 to 20 minutes store them in an airtight container. Please leave a comment and rate it.